This reaction had been known for several decades when in 1937, Otto Bayer discovered how to make a plastic usable, free from polyisocyanate and polyol. Technologies of urethane were brought to the United States in 1953 by Jean-Pierre Abbat and Fritz Hartmann. Polyurethanes can be manufactured with a large variety of textures and hardness's by varying the monomers used and by adding other substances. They are used for the adhesives, paintings, elastomers ("rubber"), foams, fibres. 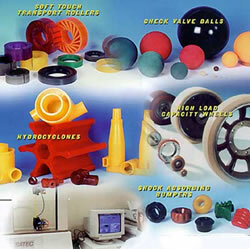 Thus, these plastics with the vast applications are used in a great number of industries. In the years 1970, the use of urethane for the wheels revolutionized the sports on casters (roller skate, board with casters). The most known property of PU is its abrasion resistance. According to standard tests, the abrasion resistance of polyurethanes is about two and a half to five times higher than for many rubber raw materials and about three to four times higher than that of soft PVC. The differences in the field are frequently even greater, since the excellent damping and impact resilience of polyurethane does not come into play with the standard test methods. (The following information does not apply to electrically conductive, antistatic and flame-resistant types.) Like all organic materials, polyurethane is combustible. The toxicity of the combustion gases and smoke density are usually measured according to DIN 53436. Judged on the basis of this leading international standard, the potential release of hazardous substances (acute inhalation toxicity) at 800°c is no worse than that of natural products such as wood, wool or leather. The ERLAN quality is very interesting because it combines design features which can give excellent results in much applications as well as a report/ratio advantageous price quality. For the solution of customized problems beyond that modified PU casting systems stand for order, for e.g.